Germany may be the host nation for Group B but they aren’t amongst the immediate picks to get through this group. This makes their opening game against Iceland vital if they want to ensure they play games in Lille as well as Berlin this summer! The host nation gets Group B underway on Saturday. Host nation teams have the right to defer their game to the last one of the day but with this round of games taking place on a Monday, the Germans clearly believe an afternoon tip-off is good for them. There can be a great chance to get their tournament off to a flying start and the bookmakers think that they will take care of Iceland with a minimum of fuss and effort. There is slight disappointment for the Berlin fans with Akeem Vargas from ALBA Berlin being omitted from the squad. However with NBA legend Dirk Nowitzki and up and coming NBA player Dennis Schröeder in the squad, the German side looks to be in good shape. Iceland lost out to Belgium in a friendly game but Hlynur Baeringsson was in decent form and he will need to be at his best if Iceland are to push the hosts on this game. Tipping Iceland with a +17.5 handicap at odds of 1.90 should keep you interested to the end of the game. For the Over/Under market, look for OVER 145.5 at odds of 1.90. Bet Now! This is the game between the two outsiders of the group so both sides will be desperate to win. 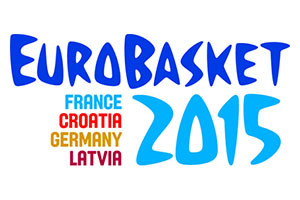 This could well be the game of the opening day in the 2015 EuroBasket event and you can bet that there will be plenty of people tuning in to see what is on offer in this game. Both teams know that a win is vital if they want to march through to the next round with confidence. The Spanish team are still ranked second in the FIBA rankings, only behind the United States of America, but we all know how they crumbled under the expectations placed on them last summer when they hosted the FIBA World Cup. Spain have a lot to prove but equally, can they show that they have the mettle and strength to bounce back? With NBA experience in the form of Pau Gasol and a strong depth of Euroleague success, Spain should be able to put up a strong fight at this tournament. Taking Spain at -3.5, at odds of 1.90, should be a good way to get started and if you want to go Over/Under, opt to go UNER 149.5 at odds of 1.90. Bet Now! Nemanja Dangubic and Vladimir Stimac were the last two names omitted from the Serbian squad, but there is still plenty of quality involved with the squad. Nemanja Bjelica is a player that grabbed many headlines in the Euroleague last season and his presence could be crucial for Serbia in this game. This is the game between the teams that many people are tipping to take the third and fourth placed spots, and again, a win is crucial in laying down a marker and getting the result that they need. The Italian team is missing Riccardo Cervi, Peppe Poeta and Davide Pascolo but with players like Alessandro Gentile and Daniel Hackett, they have players with plenty of big game experience to fall back on. The fact that big name players like Ersan Ilyasova, Bobby Dixon, Melih Mahmutoglu were all rested in a recent warm-up game against Holland suggests that they will be key players for Turkey this tournament. Cedi Osman also sat out through injury so he may need some time to get up to speed for the tournament. It could be a close one so taking Turkey with a +6.5 handicap, at odds of 1.90, is likely to be of benefit. For the Over/Under market, opt for OVER 143.5 at odds of 1.90. Bet Now!